For convenience to airport buses, taxis, and the People Mover to the Marittima cruise terminals, the four-star Hotel Santa Chiara is hard to beat: It's at the northeastern corner of the Piazzale Roma, next to the Calatrava Bridge that leads to the Santa Lucia Railroad Station. The hotel's reputation and location make it popular (especially among cruise passengers), so book well in advance if you want to be sure of a room. From the airport bus, taxi stand, or People Mover, walk toward the row of trees at the eastern end of the square. Right before you reach the hotel, you'll see a paved ramp leading down to the water and an ambulance pier. Go down the ramp, turn left, and continue around to the front of the hotel (where you'll find the main entrance). Cross the bridge to the Piazzale Roma. 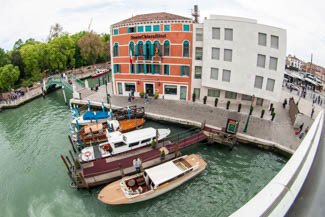 The Hotel Santa Chiara will be on your left, just a few meters from the bridge.